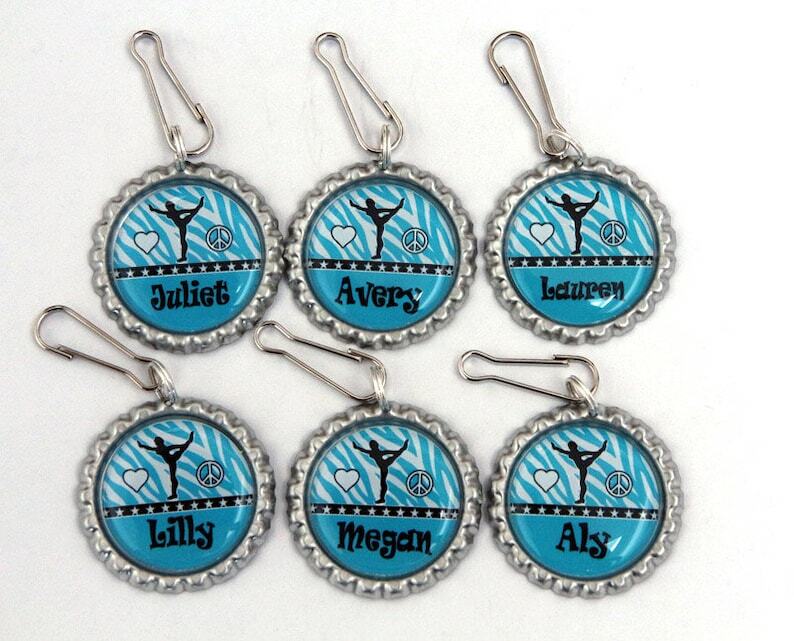 Custom Personalized Name Bag Backpack Zipper Pull Name ID Tag Luggage Tag Charm - gymnastics blue zebra print or custom color. Unique kids boys girls party favors, holiday favors for classmates or team members,kids birthday gifts! Kids love this cute zipper pull tag with their name on their backpack/bag. The design is completely customizable with your preferred background color and name. This is a listing of 1 piece zipper pulls. Just make a note of your request at Note to Seller during checkout. Please contact me for more quantities!Discount price available for bulk order! Any designs available in yayadiyclub.etsy.com can be applied to zipper pull. Please take time to browse more designs at yayadiyclub.etsy.com, and pick the one you like. If you don't see the design/color you like, please feel free to contact me and I will create one for you. We also offer wholesale orders to boutique retailers. Made with 1.25" flattened bottle cap, chic graphic paper design sealed with resin dome to beautify as well as protect the designs.The necklaces, wine glass charm and magnets are also available as options.